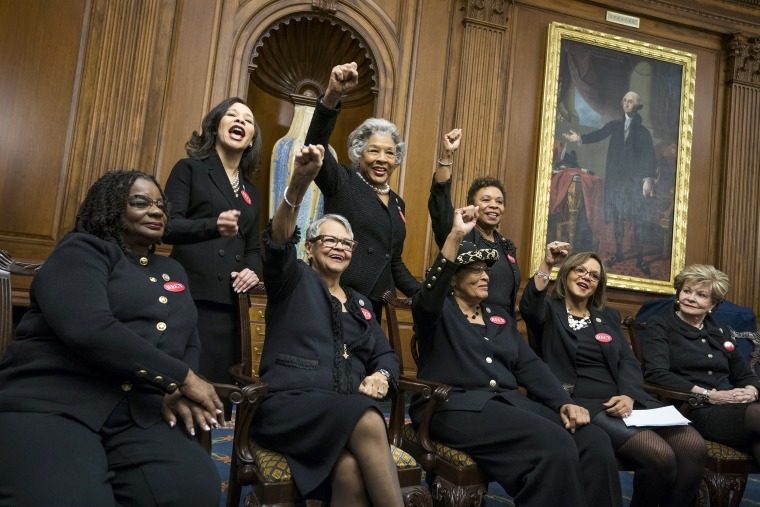 Many lawmakers wore black in solidarity with the #MeToo movement to President Donald Trump’s State of the Union address on Tuesday night and some congressional members also adorned their clothes with pins in honor of Recy Taylor. On a summer evening in 1944, Taylor was abducted and raped by six white men while on her way home from church; she was 24. She was told she would be killed if she reported the incident to authorities. She made national headlines after going forward anyway. The NAACP sent civil rights activist Rosa Parks to advocate for Taylor, years before Parks refused to give up her seat on a Montgomery bus. Taylor's rapists were never prosecuted, and she passed away in December at age 97. Taylor's granddaughter Mary Joyce Owens, 59, was a guest of Alabama Rep. Terri A. Sewell at the State of the Union address. Owens said she was speechless and overwhelmed by the amount of support her grandmother has received. Owens, her daughter Alicia Walker and other members of her family met with members of Congress in Washington on Tuesday ahead of the address. Owens said she has never watched a State of the Union address in person and wishes her grandmother were alive to witness the recognition.